Truth about Zhask - General Discussion - Mobile Legends: Bang Bang - Powered by Discuz! I've read a post about Zhash on facebook stating that Zhask is actually a God of a another universe. Well, honestly speaking, Lunox is the God of the host universe. Zhask is just considered as an Alien. Kastiyans. An alien race who specialize pyshic abilities and recently acquired the knowledge to spawn spirit insects known as "Domerey" in Kastiyan language. A good and accurate example is his Epic Skin which is Bone - Flamen. Flamen is a priest of the ancient Roman religion - in charged of the fifteen deities. Deities are supernatural being and considered as divine or sacred. So what exactly is Zhask? A God? A little known fact, Aliens are also omnipotent. Theres no news regarding about dead aliens. "Assigned to one of the fifteen deities" is there a dark secret about that fact? Lets take a look at the picture of his wallpaper so find out ta hint or perhaps an answer. Notice theres at least 4 or more being tortured in the middle, right? My speculations those are humans whom he abused and murdered on that scene. The pose seems like Zhask tortured those people is the method how Witches are killed it is also stated in the archaeology. Its a method used in the dark ages even way before the fight of WW1. You cant help but to notice theres a arm/hand trying to reach out on the left side. Who is he/she trying to reach to? Zhask has a gem or shard on his chest. It is said that it is the source of his power and would likely be considered as his heart. Some theory claiming that it is a shard is the core of a dying planet that Zhask annihilated. It was so small that even him can harness the power which also madly increased the capacity of his trencheon staff. Also, do mind the location of our subject. He is located somewhere inside a cavern. You can also say its located in Hell or its the planet he dominated without mercy. One of his quotes "I am OMNISCIENT!" meaning he knows everything. Every history that is happening in the Land of Dawn he also foresaw the event. "Entropy is inevitable!" meaning that everything happens for a reason. Every destruction and death are calculated. Everything is has plan - a plan that always leads the basic elementary numbers 1 - 100, young - old, short - tall - short, 1001-10110. Everything started from scratch and it all lies to Zhask's head! 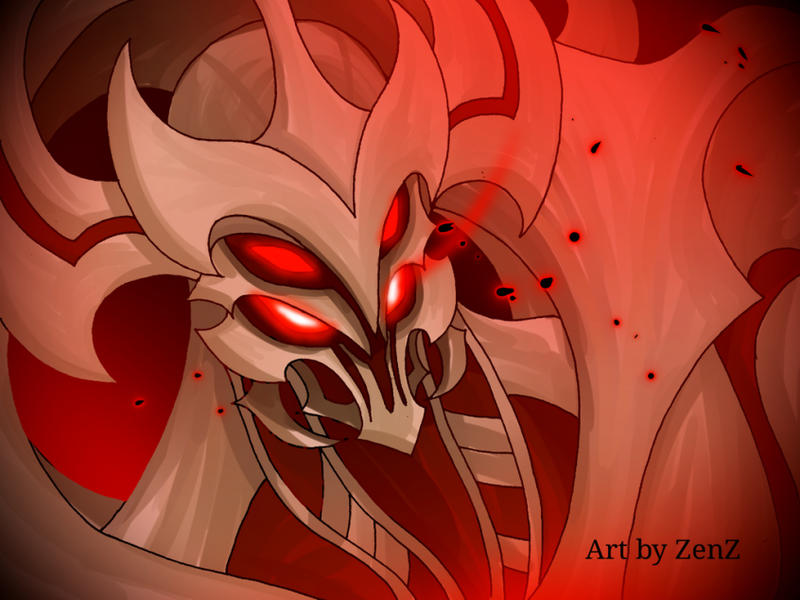 What do you really think about Zhask aside from being an extraterrestrial character? • Truth about Odette "Butterfly Goddess"
BUT HEY cool writing here, make more please! The truth.... The truth is zhask isnt real. Why not write about something real? Like how moonton cant grasp the concept of balanced heroes. Kimmy is retarded op. Unless its a bad player, shes mvp 8/10 games. Meanwhile I'm desperately waiting for another Zhask buff. The recent buff for him is not good enough. And most of the time nothing.